lapsang souchong tea in Chinese health benefits: anti-cancer, weight loss, Diuretic, Anti-inflammatory, Detoxificatio, Refreshing, Shengjin, Antioxidant, anti-aging, Stomach warming, Diastolic vascular benefits. lapsang souchong tea was born in the late Ming and early Qing dynasties. It is produced in the beautiful world-class “World Heritage Site” China National Nature Reserve – Wuyi Mountain, Fujian Province. It is a famous historical tea in China. It was as early as the early 17th century. It was exported to Europe and was very popular. It was once selected as the royal black tea by the then Royal England, and thus induced the famous “afternoon tea”. Historically, BOHEA refers to “lapsang souchong tea”, which was a symbol of Chinese tea at that time. Due to its unique quality, it has become the world famous black tea LAPSANG SOUCHONG. In 2002, the tea obtained the registration of China’s origin protection products. Since 2000, the tea has obtained German BCS, Japan JAS and US NOP International Organic Certification. 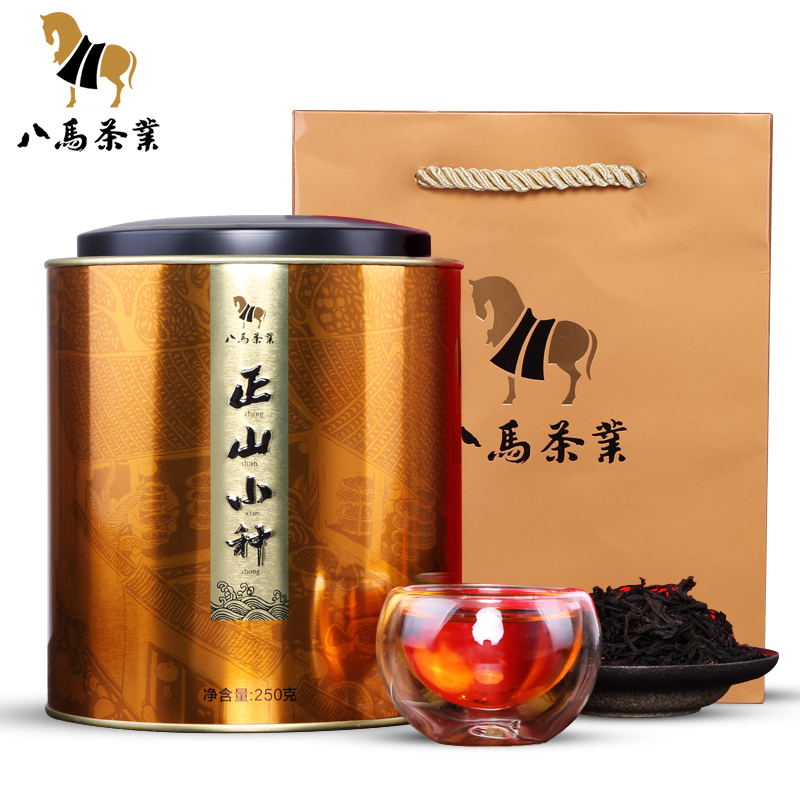 The tea won the Gold Award of China (Wuhu) International Tea Industry Expo; the “Five-Star International Tea King” of Xiamen International Tea Culture Festival in China was awarded; “International Famous Tea” was won; the first tea culture festival in Wuyishan of China won “Zhengshan Small Species” Tea King Award. According to legend, in the second year of Ming longqing, in 1568, due to the turmoil of the current situation, and Tongmu was the key place. there was an army invasion. On one occasion, an army entered Fujian from Jiangxi to cross the border Tongmu, occupying a tea factory, and the tea farmers fled to the mountains to escape the war. During the evasion period, the tea to be prepared could not be dried in a charcoal fire in time, and the excessive fermentation produced a red change. Subsequently, in order to recover the loss, the tea farmers adopted the flammable pine wood to heat and dry, forming a variety of tea with both concentrated pine and dried scent. This is the earliest black tea in history, also known as “LAPSANG SOUCHONG black tea”. Under the combined action of caffeine and aromatic substances in black tea, the blood flow of the kidney is increased, the glomerular filtration rate is increased, the renal microvasculature is expanded, and the reabsorption of water by the renal tubule is inhibited, thereby contributing to an increase in urine output. This is beneficial to eliminate lactic acid, uric acid (related to gout), excessive salt (related to high blood pressure), harmful substances, etc., and to alleviate edema caused by heart disease or nephritis. The polyphenolic compounds in black tea have an anti-inflammatory benefits, and it has been found through experiments that catechins can be combined with single-cell bacteria to coagulate and precipitate proteins, thereby inhibiting and eliminating pathogenic bacteria. Therefore, it is beneficial to drink black tea for patients with bacterial dysentery and food poisoning. Folks also use strong tea to apply wounds, hemorrhoids and Hong Kong feet. According to experiments, tea polyphenols in lapsang souchong tea can absorb heavy metals and alkaloids, and precipitate and decompose. This is a boon for modern people who drink water and food industrial pollution. Through medical experiments, it was found that caffeine in black tea stimulates the nerve center by stimulating the cerebral cortex, which promotes refreshing and concentration of thinking, which makes the thinking reaction more sensitive and memory enhanced. It also has excitatory benefitss on the vascular system and heart, strengthening the heart. Beat, thereby speeding up blood circulation to promote metabolism, while promoting sweating and diuresis, thereby accelerating the excretion of lactic acid (a substance that makes muscles feel tired) and other old waste materials in the body to achieve the benefits of eliminating fatigue. The results show that antioxidants in green tea and black tea can completely destroy the path of chemical substances in cancer cells. Dr. Murray Mitterman, director of cardiovascular epidemiology at the Boston Beth Israel Deaconess Medical School, said: “The efficacy of black tea and green tea is roughly the same, but the antioxidants in the mountain are much more complicated than green tea, especially for the heart. It is beneficial.” American magazines report that black tea has stronger anti-aging benefitss than garlic head, broccoli and carrots. Drinking green tea when people are not eating will feel uncomfortable in the stomach. This is because tea polyphenols, which are important substances in tea, have astringent properties and have a certain stimulating benefits on the stomach. In the case of fasting, the irritating benefits is even more irritating. Strong. Black tea is different. It is fermented and dried. The polyphenols undergo enzymatic oxidation under the action of oxidase, and the content is reduced, and the irritation to the stomach is reduced. Black tea not only does not hurt the stomach, but can raise the stomach. Regular consumption of black tea with added sugar and milk can reduce inflammation and protect the gastric mucosa, and it also has a certain benefits on the treatment of ulcers. The argument that tea has anti-cancer benefitss is very popular. Researchers around the world have also done a lot of research on this, but it is generally believed that the anti-cancer benefits of tea is mainly reflected in green tea, but now there are new developments. The study found that black tea, like green tea, also has a strong anti-cancer benefits. In addition, black tea also has anti-mite, stomach and intestine to help digestion, delay aging, lowering blood sugar, lowering blood pressure, lowering blood fat, anti-cancer, anti-radiation and other benefitss; black tea is also an excellent sports drink, in addition to quenching thirst and replenishing moisture If you want to drink before the exercise that requires physical strength and endurance (such as a marathon), because the caffeine in the tea has a refreshing benefits, it can promote the body to burn the fat supply heat and retain the liver vinegar during the exercise, so people are more Durable. (1) Picking of young tea trees: Under the condition of normal fertilizer and water management, after two stereotypes and pruning, the tree height can reach more than 45 cm in the late spring tea period. After the third shaping, the tea tree is as high as 60 cm. , can use the method of “topping and leaving leaves” to pick. The standard of retention is spring tea leaves two, three leaves, one bud one and two leaves; summer tea leaves two leaves, one bud one and two leaves; autumn tea leaves one leaf, mining one bud one and two leaves. In the process of picking young tea trees, we should pay attention to the principle of “topping and raising the edge, collecting high and raising low, collecting and cultivating thin”. After three times of pruning and topping leaves, young tea trees can be managed with adult tree picking measures when the tree is as high as 60-80 cm and the tree width is about 130 cm. (2) Picking of adult tea trees: Adult tea trees should adhere to the principle of “taking mining as the mainstay, combining mining and mining, and timely mining”, so that it is possible to obtain higher economic benefits in a long period of time. Spring tea is a famous tea raw material, mostly single bud, one bud and one leaf initial exhibition or one bud and one leaf exhibition. If 5% reaches the mining standard, tea can be collected. The famous tea requires fine and even raw materials. Generally, one bud and one leaf are first picked, one bud and one leaf exhibition or single bud. Bulk red tea, green tea, and red broken tea require medium tenderness. Generally, the first and second leaves are harvested and the paired leaves are picked. Oil tea and Liubao tea require the use of basic mature shoots and pairs of two to three leaves. It is generally possible to use the method of “retaining fish leaves throughout the year” or “spring and summer tea leaves, leaf leaves for autumn tea, timely and batchwise, and retention according to standards”. (3) Mechanical tea picking: In recent years, tea picking machines promoted in large-scale tea farms in China have two types: double stretcher type, mobile type, spiral hob cutting type, tea machine and horizontal rotary knife cutting type tea picking machine. The picking quality of these two tea picking machines is good, the operation is convenient, and it can adapt to the tea garden operation of various terrains, and the work efficiency is about 10 times higher than that of manual tea picking. In the trial use of tea gardens that promote tea picking, the fertilizer cultivation measures need to be strengthened. (4) Fresh leaf management: The fresh leaves collected should be transported to the tea processing factory in time. After being checked by the special person, they should be placed in the clean and shady room as soon as possible, and the indoor ventilation should be kept as much as possible. The container for conveying fresh leaves is made of a bamboo basket with good air permeability and cleanness. The capacity of the basket is preferably 50-100 kg, avoiding extrusion during transportation and reducing damage. It is generally required that fresh leaves will enter the factory within 4 hours after picking. If it cannot be sent to the tea factory in time, be sure to avoid sun and rain, and keep it fresh and clean.